This is my first post here! MTGStudio is a great app. But there are some problems which stop me from taking out my Credit Card. I can't choose any other language version. Not even Bulgarian or the one I edit. I can't enter Polish letters like ę in system or while editing language version due to some shortcut override which brings MTG Studio on top. Very annoying. The combination for entering ę is "right ALT+ e" which is also CTRL+ALT+e in some cases. Keyboard setting in Windows - Polish (programmer). I hope those problems are repeatable and can be solved in some way. Thanks in advance! The version value determines whether the language file is suitable for the installed version of MTG Studio. Change it from 1.1.0 to 1.2.0 and you will be able to see the Bulgarian language in the Options form. You are right this is a bug which has not noticed till now. Soon there will be a new version with this issue fixed. The interface will allow removing the shortcut by hitting backspace. We have never tested the application with Polish locale instaled but you are right. The Ctrl+Alt+E key combination is the default one for "Restore Application". The next version will alllow changing (or removing) this shortcut from the Options|Shortcut menu. I will try to fix those issues tonight and if you send me an email I can send you the fix within a few days. I have fixed the mentioned issues. See the screenshot belowshowing the added "Restore" action whose shortcut is changed from "Ctrl+Alt+E" to "None". Thanks for your answers gaddlord! Good to know. 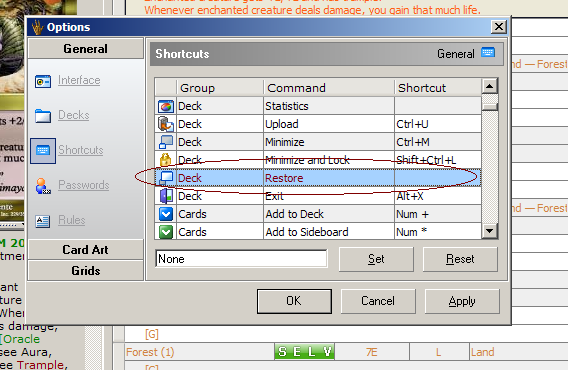 I was thinking that version definition is what minimal version of MTGStudio you should have for translation to work. Now I know that this is the exact version for translation to work. I'm glad that this bug will be fixed. Good to know that I could help! As for Polish locale here's what follows. Polish keyboard setting uses RIGHT ALT + letter for specific Polish letters. Those letters are: A C E L N O S X Z. It's also a fact, that in some applications (mostly games) RIGHT ALT is read as CTRL+ALT therefore trying to write using Polish letters results in calling shortcuted functions. I think adding option for removing those shortcuts would be a solution but it would be nice for an app to distinguish between pressing RIGHT ALT and pressing LEFT ALT with CTRL. BTW in Polish locale most of shortcuts with ALT should work only with LEFT ALT leaving right one as a modifier for letters. Thanks again for your answers gaddlord and... I'm checking my email inbox! And one more thing. I wanted to open deck from MTG Online. I've tried to open Rakdos Bloodsport.dec from Dissension and... some cards where missing in database. Does 1.2.0 support MTG Online decks from latests editions? Last edited by grocal on Wed Jun 07, 2006 8:57 am, edited 1 time in total. The new card definitions file (mtgstudio.hfw) with updated Dissension MTG Onliine card identifiers is sent to you by email. Thanks again, gaddlord for helping me out and squishing some bugs From my point of view I'll try to find and report any other problems that may arise. So far - so good! TNX! I see this was reported long time ago, but I have similar problem right now. Every time I am using right alt + e, it pop up MTG Studio for me, I have changed and saved File Restore shortcuts, so it's not Ctrl+Alt+B instead of E, but it still bringing back app. It's very anoying because in polish I use a lot of alt + e, combination. After restarting app, it's showing still that it's changed so I don't know what more I could do to fix that.